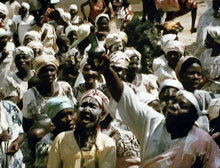 On the coast of Ghana, in the shadows of the Portuguese slave forts, lies the Gulf of Guinea. This sea is home to the "surf boys", teams of expert fisherman who paddle into the ocean in large canoes, sometimes staying at sea for one or even two nights. 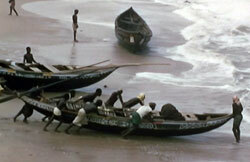 In MAMMY WATER, Jean Rouch depicts the surf boys of the coastal village of Shama, at the foot of the Pra River. Their success is governed by water spirits ('Mammy Water'). When the catch is bad, villagers must honor the spirits with a ceremony if they wish to change their fortunes. The film captures one such ceremony: The Festival of the King of Shama. The whole village takes part in a procession that concludes with a series of offerings to the sea. Afterwards, surf boys pile into their canoes and head back into the ocean. Will their luck be better? More strictly observational than most of Rouch's films, MAMMY WATER takes an intimate look at the spiritual traditions and the wider life of a West African fishing village. Jean Rouch's self-reflexive depiction of lion hunting among the Songhay people of Niger, and the social structure that underlies it. Jean Rouch's essential and controversial work is a classic of ethnographic cinema.